Anyone with multiple computers like a desktop, personal laptop and a work laptop would know the pains to find the right file you need for a task at hand from one of those computers. It just adds to the complexity if you are sharing some of those documents with someone else. You probably find yourself continuously uploading, downloading files, syncing you folders with an online storage solution. I have had the privilege of using DropBox (still in private beta) for the last few weeks and I am definitely amazed by the thoughtfulness of the developers. It is designed to be completely painless to use while consuming reasonable amount of resources – cpu & bandwidth. You just need to install the DropBox software (7 MB file) in your computer and it integrates with the file explorer and runs in the background. From your online account, you link your web account with the desktop software. 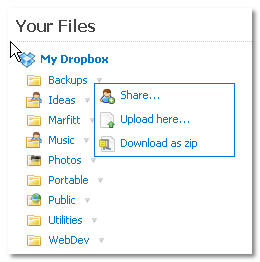 From then on, anything you drop in the ‘My DropBox’ folder gets sync’ed with your online account. Synchronizes multiple computers if you linked them all with the same account instantly. Delete a file by mistake? Restore a copy from online. Share files with friends and family by sharing a folder with them. Sync is almost instantaneous. 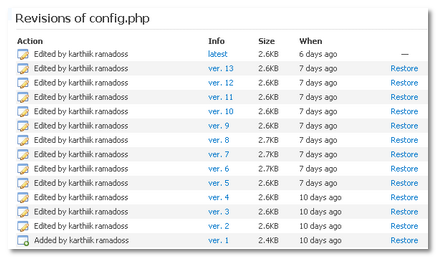 File changes are detected as incremental changes instead of uploading/downloading whole changed files. 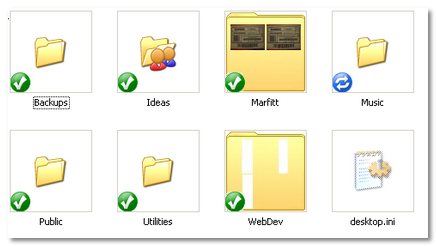 Blue icon on a file/folder indicates that the sync on that particular item is pending and green means it’s in sync. Even when you are away from your computer, just upload files (25MB max) to your online account and when you go home, it’ll be in your home computer. Ready for you. If all this isn’t enough, if you’d like to download a large folder from your online account, there is an option to download the contents of the folder as a zip file saving you precious time. You can share a url to your photos folder with friends and family. No more choosing photos to upload to special service. Works right now on Windows & Mac but a Linux version is promised in the future. Works seamlessly through proxies as well. The real beauty of this solution is in the simplicity and how transparent it is to you once you start using. Since it’s in beta, it is free for 5GB but the developers have plans to add paid plans in the future. For such a cool service, I really wouldn’t mind paying as I have already been contemplating a reliable online storage system like Amazon S3. I would love to see more features like profiles for different computers. It would be nice not to sync my personal files like Music, Photos, etc. to my work laptop. With the service in closed beta, I am sure there will be more features coming up before the public release. I have a few invites for Dropbox. If you’d like to try it, leave me a comment and I’ll send it to your email. What do you think of this service? How much is the comfort this service offers worth to you? You can even get a Portable Dropbox now. And don’t forget to try out Try Dropbox Professional. Dude! I would love to get an invite for DropBox. This is the tool I have been looking for for almost a year to allow me to share files from my desktop computer to my notebook computer! I have tried several tools and haven’t found any tools that work as well as DropBox looks like it will. Dave M.@Mac Switcher’s last blog post..Are you seeing this site correctly? Hi! Very interesting….I would be very interested in testing it. I would love an invite if you still have some left. yes, please. i’ve been very interested in dropbox. it looks to be potentially fantastic, especially for working on long-distance, collaborative projects. first, thank you kindly for the invite. ‘ve only had the chance to play with dropbox briefly, but i can already tell it’s going to be a winner. dropbox has been quite easy for me to learn to use. a no-brainer, if you will. i’ve not yet had to ask, “how do i do x” and search for a solution. it’s all very reasonable, rational and logical. that’s something i really appreciate in a user interface. i’ve installed the dropbox app on my oldest, slowest laptop and it runs smoothly. as you noted, it is not resource intensive. it also does seem to integrate well with the system (again, something you also made note of). i’m sure that as i have time to make greater use of dropbox, i’ll find plenty of things i’d like to see changed or improved, but even in beta it is clearly a very well-implemented product. Great review. It looks like a really great service. Does anyone have any beta invites left? If so thanks in advance. Hi, considering how good your review is, i’m curious to try dropbox myself (i currently use box.net which is pretty cool too and would be curious to see how they compare). would you have a spare invitation? Please, if you still have invites left… This might be just what I’ve been looking for. It’s always a pain to keep home and office synchronized (dongle, FTP etc). Now this could be almost automatic?! Thanks anyway for making it known (to me)! Hey everyone.. thanks for taking the time to comment. But, I am sorry I have quickly run out of invites to DropBox. I will definitely give it away here as they add more to my account. I would love to try it. Do send me if you get any more invites. Is it too late for invites ? If you have any please send one my way..will appreciate it..
Ah, it’s too bad that you ran out of invites! But if you ever receive some more, I know I could always use one. 🙂 Thanks in advance. @Madhur: Would you mind telling me what WordPress plugins you are using for the feature that shows the Nation, OS, and browser in your comments? Also, the one that is displaying the comment preview dynamically under the editor? I would love to implement them on my blog. This is exactly what I am looking for. I have an imac and a macbook that I like to stay synced to….never know which part of the house I will be in. Please send me an invite if at all possible, it would be very appreciated! This is one of the best online storage service launched recently, I simply loved it. Great concept and application. Domingo, Mary.. thanks and I’ll let you know if I get more invites. Nirmal.. isn’t it sweet? I already find it indispensable and its becoming second nature to just get to my files from any of our computers. Hi dude! i would love to have this. I appreciate it very much if you could kindly send invitation to me. Thanking you in advance, and have a nice day!! I’m also interested in trying out Dropbox after Foldersync started having problems after upgrade. It happens every so often. If anyone has invites, I’d be grateful to receive one. Thanks! Foldershare worked ok for me…except that it could not connect thru my company’s firewall. Hey guys.. I will definitely update the post if I get any more invites. Got any more invites? I’m dying to try this thing. This will be one of those technologies that we’ll be able to look back and wonder how we ever got along without it. If you like DropBox, you should try out SugarSync. You won’t be limited to the one folder that is designated for you (i.e. you can sync any folder from one computer to any folder on another computer) and you also get mobile access. I’de loooove to have an invite? Anyone? Hey, good article, could I get an invite? A would greatly appreciate an invite at nicholas *at* thelastreal *dot* com. I know you’re out now, but if you get more invites I’d LOVE one! Thanks!! Very interested in joining and would welcome and invite. Please send me a Dropbox. S really like to try out the service. Thanks. If you have an extra invitation for dropbox I would really appreciate it. Thanks! I am also very psyched about DropBox. Please send me an invite if possible.